Easily one of the busiest voice actors in the world, millions of fans know him as the voice of Duo Maxwell from Gundam Wing and Gundam: Battle Assault 2 as well as Koga from the hit series Inuyasha. Older fans may be familiar with his work as Piccolo in Dragon Ball Z and/or his work as Deadeye Duck in Bucky O'Hare and The Toad Wars. Fans of Transformers know Scott well, as his voice talents have brought countless memorable characters to life, including Dinobot, Waspinator, Rattrap, Silverbolt and Dinobot II in Beast Wars/Beast Machines; Jetfire in Armada; and Jetfire and Strongarm in Energon. He can also currently be heard as Snarl and Backstop in Transformers: Cybertron. Scott's voice work has earned him the adoration of fans worldwide. Fans find Scott's work everywhere, both in anime and domestic animation, including lending his vocal talents to Hohenheim in Full Metal Alchemist; Wolverine/Logan in X-Men: Evolution; Ace - The Bathound and Ignatius in Krypto: The Superdog; Destro and Gung Ho in G.I. Joe: Valor vs. Venom / Spy Trooops; Beast Man, Clawful, Mer-Man, Ram Man, Stratos, and Kobra Khan in He-Man And The Masters Of The Universe; Senor Hasbeena, Francisco of the Forest, Mino-Toro, El Perrito, and Heavy Traffic in ¡Mucha Lucha! ; Vulture, Man-Wolf and Lester in Spider-Man Unlimited. Other notable voice work in anime includes King Aston and Jajuka in The Vision Of Escaflowne; Jajuka in Escaflowne: The Movie; Zoids Battle Announcer, Deed #1, Rastani Sr., and Serge in Zoids Fuzors; and Harlock in Galaxy Express 999/Adieu, Galaxy Express 999. His work can also be heard in series and movies such as Johnny Test, Bionicle, Scary Godmother, Barbie: Fairytopia, Barbie Of Swan Lake, Candyland: Great Lollipop Adventure, Dragon Booster, Gundam Seed, Gundam Seed Destiny, Under The Skin, Master Keaton, Ben Hur, Yakkity Yak, The Christmas Orange, Frogger Beyond, Reboot, Rudolph The Red-Nosed Reindeer & The Island Of Misfit Toys, Nascar Racers, Casper's Haunted Christmas, Weird-Ohs, Shadowraiders/War Planets, Jin Roh: The Wolf Brigade, Warriors Of Virtue, The Wacky World Of Tex Avery, Ranma 1/2, Hamtaro, and many more too numerous to list! 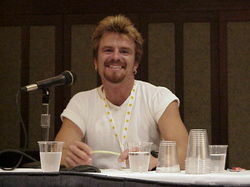 Aside from his voice work, Scott is also an accomplished live-action actor, whose credits include The Green Chain, Scooby Doo 2: Monsters Unleashed, Stargate Sg-1, Strange Frequency, The Outer Limits, Ladies And The Champ, Viper, Ninja Turtles: The Next Mutation, Extreme Dinosaurs, Highlander, Hawkeye, Final Fight, Someone Else's Child, Seasons Of The Heart, Crackerjack, and Sleeping With Strangers. Scott is currently exercising his evil genius in Gundam 00 as the dark and enigmatic Ali AlSaachez, and Voltar, the truly maniacal evil genius, in League of Super Evil. Some of his other present projects include Powerpuff Girls Z, Maryoku Yummy, Rollbots, and Twisted Whiskers. ...and when his busy schedule permits he can be found playing his level 70 Blood Elf Priest on World of Warcraft.